Who Started the Red Carpet Tradition? 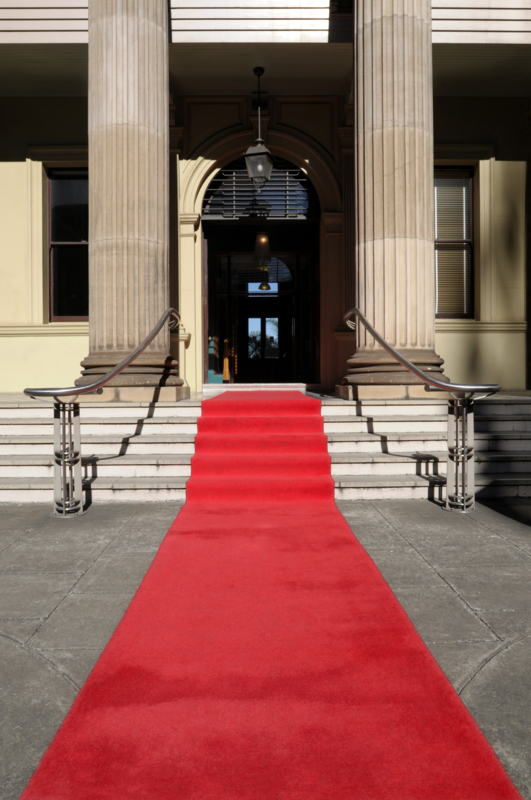 David asks: When did the tradition of rolling out a red carpet for celebrities start? Throughout history, red carpets have led luminaries to momentous events, both good and bad. Aeschylus (525 BC – 455 BC), the “father of tragedy,” wrote various plays where his heroes fell from grace due to a combination of unwinnable circumstances, arrogance and/or simply stepping on the gods’ toes. A few years before his death, Aeschylus wrote Agamemnon, in which, after a ten-plus year absence from his kingdom of Mycenae, King Agamemnon returned home to his wife, Clytemnestra, triumphant from the Trojan War and dragging along his new concubine, Cassandra. Clytemnestra was happy to see Agamemnon, but only because now she could seek her vengeance – not only for his new lady friend, but more particularly for his role in the death of their daughter, Iphigenia, a decade previous. Just before the Greek fleet had sailed off to fight the Trojan War, Agamemnon killed one of the goddess Artemis’ deer, which enraged her, leading to Artemis’ interfering with the Greek fleet leaving. To appease her, Agamemnon was forced to sacrifice his oldest daughter, obviously without Clytemnestra’s consent. You women . . . Spread out those tapestries, here on the ground, directly in his path [which shall] be covered all in red so Justice can lead him back into his home . . . .
Don’t invite envy to cross my path . . . That’s how we honor gods . . . For a mortal man to place his foot like this on rich embroidery is . . . not without some risk. Eventually, however, he relented to Clytemnestra’s pestering, albeit after first removing his sandals, and walked barefoot on the red carpet that led him into his palace . . . and eventual doom (shortly after this, Clytemnestra stabbed him to death in the bathtub). Whether it was fear of the wrath of the gods, or lack of sufficient textiles, there are few episodes recorded of other similar red carpet uses for the next 2,000 years, although it does seem to have occurred on occasion. Fast-forwarding significantly through history, one notable example came in the early 1800s, when the fifth President of the United States, James Monroe (1753-1831), disembarked from a riverboat in Georgetown, SC, and his welcoming party greeted him with a ceremonial red carpet. Again mostly disappearing into obscurity for awhile, the practice was revived in the early 1900s, this time by the New York Central Railroad, which rolled out the red carpet as part of the first class service given on its 20th Century Limited train. Operating nightly from New York to Chicago from 1938 until 1968, passengers on the 20th Century Limited entered the train after following a path made by the plush, football field length, vibrantly red rug that spanned the length of the train- from the engine to the observation car. Co-opting the cachet and opulence of the red carpet, showman and theater magnate Sid Grauman (of the now famous Chinese Theater in front of which celebrities still place their hands in wet cement) is widely credited with introducing the practice to Hollywood when he had a red carpet placed for the stars to follow at the premier of Robin Hood at his Egyptian Theatre in 1922. Also needing a practical method of guiding its numerous stars through the throng on Oscar night, the Academy first placed a red carpet to lead celebrities from their cars to the Santa Monica Civil Auditorium in 1961. By 1964, realizing the public’s interest in seeing more of Hollywood’s best and brightest, Oscar producers began spending more time on exterior shots of the stars walking the carpet. Nonetheless, even by the early 1960s, the red carpet was still little more than a trail to be followed. 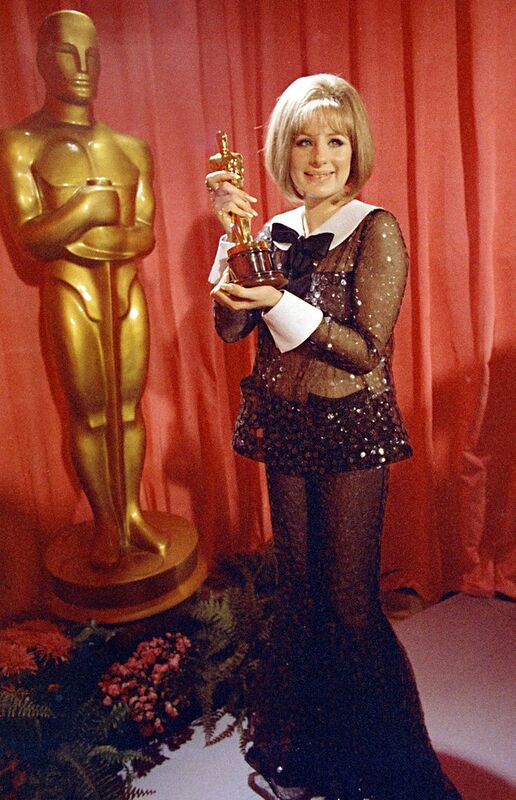 This all changed in the 1970s, following Barbra Streisand’s sensational see-through pantsuit best actress acceptance speech in 1969, as celebrities began competing for the publicity and exposure afforded by the red carpet by exploring their fashion sense. Together with the introduction of People magazine, the award show red carpet was transformed into a fashion runway that was as accessible as the television in your living room. Today sporting the 360 degree GlamCam (which nearly instantly shows a star’s outfit from every angle), the fingernail-art highlighting Mani Cam and a cadre of perky, pretty and funny people cooing, cajoling and carping about fashion, modern red carpet events share little with their ancient ancestor, beyond perhaps at times being a remarkable display of hubris. What is the Origin of Hollywood’s Red Carpet? I was amazed to learn (and verify) that this train, almost eighty years ago, could make the 900+-mile trip in about fifteen hours by averaging about sixty miles per hour. Thanks for this bit of information. Have you been on a train in the last 10 years? An ice chilled AC have been luxury. The dining cart is the Swanson cart. Midwest to SanFran took nearly 3 days with engines blowing up. 15 hours is luxury unless you prefer 35 in a view car. I think you misunderstood the previous comment. A train that takes you that distance in a 15 hour trip may represent the height of luxury. The passengers on that trip are definitely not the height of luxury. That would be like saying “My uncle Bob is the height of luxury.” Silly, isn’t it?